Ce texte est l'un des premiers (peut-être même le tout premier) manuels de méditation à avoir été publié en langue anglaise. Il s'agit de la traduction d'un opuscule, à l'origine une conférence donnée par le maître Sôtô Rindô Fujimoto. Le texte fut publié en 1966 par Elsie P. Mitchell (de l'Association Bouddhiste de Cambridge) qui avait reçu, quatre ans plus tôt au Japon, les voeux bouddhistes de Fujimoto. Rindô Fujimoto, né en 1894, pratiqua notamment sous la direction de Daiun Sôgaku Harada (1870-1961), le maître Sôtô qui intégra la pratique des kôan, pour revenir par la suite à la pratique, plus orthodoxe, du "juste s'asseoir" (shikantaza). Il fut également responsable de la méditation (tantô) au monastère de Sôjiji à Yokohama. Reproduit avec l'aimable autorisation d'Elsie P. Mitchell et de David Chadwick (www.cuke.com). On lira sur le site la version française de ce texte, La Voie de zazen. 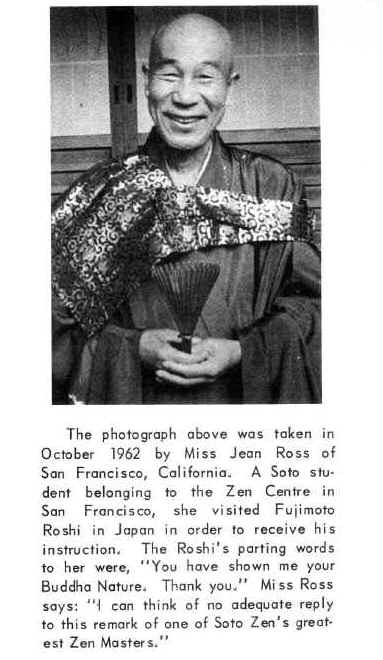 The author of this essay, Rindô Fujimoto, Rôshi (Zen Master), was born near Kobe in 1894. An official's son, he was ordained in the Sôtô Zen sect before his teens, and since that time has devoted his life to the study and practice of Buddhism. During his student days, he had his deepest satori (enlightenment) experience. An excellent student, he was urged to continue academic work, but instead he decided to enter the Sôtô Zen temple, Hosshinji. The abbot of Hosshinji, Sogaku Harada, is a Sôtô monk who was trained in the Rinzai school of Zen; he is well known as a strict disciplinarian. Sometime after Fujimoto's entrance into Hosshinji, he made the acquaintance of the Zen master Tôin lida. lida Rôshi had practiced as a layman in the Rinzai branch of Zen until the age of sixty, when he became a Sôtô monk. His temple, Shôrinji, which was named after Bodhidharma's* temple in China, is rather an unusual one and exists solely for the purpose of meditation practice. There is a small meditation hall with a dirt floor (usually such halls have stone floors) and several very small rooms in an adjoining wing. Fujimoto assisted lida Rôshi in this temple for some years before becoming Tantô (meditation teacher) in the Sôtô head temple, Sôjiji, near Yokohama. The abbot of Sôjiji at that time, Kodo Akino, is quoted as having said, "Bodhidharma is not in Shôrinji in China and the Sixth Patriarch, Hui Neng, does not live on Sokei mountain; they are here." After Master lida's death, Fujimoto Rôshi succeeded his teacher as master of Shôrinji. Eight years ago, he founded a lay group there and the essay in this book has been adapted from a lecture given to those people. Fujimoto Rôshi lives alone in his temple, where he is visited by those wishing instruction in zazen (meditation). His life is austere even by Japanese monastic standards. He eats only noodles and vegetables that shop keepers have set aside as no longer quite fresh. His only extravagance is secondhand books; he is a prodigious reader. He does not ask either his lay or priest disciples to practice austerity or to try to imitate his way of life. He is completely happy with his simple existence, which is his pleasure and not a Spartan self-improvement scheme. His lay disciples are mostly professional people; the eldest is a great grandfather. This year, when the writer visited a one day meditation session, the youngest sitter was a six-year-old who arrived with his father and a man-sized box lunch. When Fujimoto Rôshi was asked what should be written about him as a preface for this book, he laughed and replied, "It is only necessary to say that I am a Buddhist monk who lives near Kobe." I have elaborated on this somewhat for those who have never met him; for those who know him, it is enough to say that he has always been a Buddhist monk. * The Indian monk who introduced the original form of Zen into China. Meditation (dhyâna) is as old as Buddhism itself. The Indian founder, Gautama Sâkyamuni, faced the question of suffering and death in this way, after failing to find satisfaction in philosophic inquiry, asceticism, or ritual. Meditation, the precepts, charity, and reverence for all interrelated and interdependent forms of life constitute the foundation of Buddhism, though human frailty and institutional rigidity have often combined to reduce these ideals and practices to empty formalism. All Buddhist art and philosophy of any stature have sprung from the realization and harmony of these vital aspects. Whenever Buddhism has fallen too deeply into pedantry or aestheticism, a return to the fundamentals has rerooted the tradition in the realm of "ultimate concern" where it belongs. Indian dhyâna masters gathered disciples around them in China long before the formal establishment of the Chan (Jap. Zen) sect. In the Japanese Tendai sect of Buddhism, meditation was expected of monks, and as in China, Zen developed into a separate entity only after the Tendai had become very worldly. In the Tang period Taoism and Buddhism were fused after many centuries of competition amid the alternating favor of successive emperors. The resulting burst of vitality expressed itself in a very Chinese way, respect for and joy in work and simple living. In America and Europe, a Taoistically inclined Zen has aroused considerable interest, and has been interpreted in a rather humanistic light. Popular Western Zen has something for everyone, makes no demands of its enthusiasts and offers a religion without religion, as well as an admirable effort to appreciate life "just as it Is." This non Buddhist Zen fits easily and gently into a busy and prosperous culture, which attributes little value to anything that does not produce visible and immediate utility, with the least possible effort. It cannot be denied that it offers something to Puritans who are weary of misdirected crusades and utopian moralizing, and who cannot find any meaning or pleasure in the traditional liturgy or dogma of Judaic or Christian orthodoxy. Another type of non Buddhist Zen which has aroused popular Interest in the West is a yoga type of concentration practiced by Japanese artists, swordsmen, and others who wish mastery of their skills. This training requires many years of experience under a good teacher in Japan. Meditation, the discipline practiced by most of the patriarchs both before and after enlightenment, has never been popular in any Buddhist country. Nevertheless, in parts of Southeast Asia today, as in traditional Japan and China, it is carried on by a rather large percentage of intellectuals as well as by many others from every walk of life. Buddhist meditation and awakening have influenced greatly disparate cultures out of all proportion to the number of participants. Buddhist symbols as well as the spirit of the Buddhist ethic are expressions of the founder's enlightenment experience, without which the essential character of his teaching would have been lost long ago in a sea of abstruse pedantry and cultural transformations of complex and ambiguous nature. The Buddhist tradition embodies the wealth of diversely expressed moral and metaphysical insights that have arisen from the interaction of meditation with widely varying historical and geographical conditions. Where uncorrupted by institutional and other abuses, Buddhism has retained its integrity and vitality as a result of its own particular interpretation and exercise of samâdhi (complete absorption in meditation) making the founder's essential teaching available to those in very primitive as well as in very sophisticated cultures; in societies active and outgoing, as well as static and contemplative. In Mahâyâna, or Northern, Buddhism, the enlightenment experienced after samâdhi has been transcended permits great flexibility of expression; underlying this flexibility is a unity which has affirmed the best in the different cultures where it has taken root. Meditation is to Buddhism what prayer is to Christianity. Without meditation or prayer, a religion is simply one among many systems of concepts and convictions to be manipulated in accord with current taste and practical concerns. Westerners, particularly Americans, sometimes feel that meditation and other aspects of "Indian mysticism" are responsible for the poverty and problems of Asian countries. This seems to be a reductio ad absurdum of the complex and sometimes paradoxical workings of the law of cause and effect. Buddhist institutions and disciplines are subject to misuse and corruption, as are all finite human endeavors. Nevertheless, through the centuries, Buddhist monks and laymen have been social reformers, diplomats, and educators; they have established hospitals, orphanages, and refuges for the aged. Five hundred years before the birth of Christ the Indian founder of Buddhism rejected the rigid caste system of his country; the Buddhist king, Asoka (250 BC), undertook what was, even by modern standards, an ambitious program of social reform based on Buddhist principles; in the seventeenth century, the Japanese Zen monk, Tetsugen, perished with several of his disciples as the result of an infection contracted while feeding and caring for the poor during a famine. Whatever the advantages, material or psychological, of such altruistic activities, Buddhism is first and foremost a spiritual orientation and discipline. The dedicated contemplative whose life is devoted to meditation and to instruction of its discipline, is the heart and life blood of his religion. An awakening to what has been called cosmic consciousness, an understanding and acceptance (acquiescence is not implied) of Karma, the good or evil consequences of one's own as well as others' attitudes and actions, is the foundation on which Buddhist compassion and altruism rest. As an end in itself, altruism towards family, race or even species is not in the Buddhist spirit, and material and physical well being are not the Buddhist summum bonum of life. However, practice and insight can only find expression in the physical and historical; Buddhist samâdhi is not a retreat or escape from the world. The Indian prince who founded Buddhism renounced the temptation to use samâdhi for his own pleasure and comfort and spent forty-five years sharing his experience with others. The Christ died for mankind; the Buddha lived for his fellow beings. After experiencing "the dark night of the soul," the Buddha died and was reborn under the Bodhi tree, and his life after this resurrection is as important to Buddhists as Christ's death and resurrection are to Christians. One of the prevailing misconceptions about Zen (among young Japanese as well as Westerners) is that Zen people discipline themselves to become a kind of supermen who are free to disregard the Buddhist precepts, as well as all convention and consideration for others. 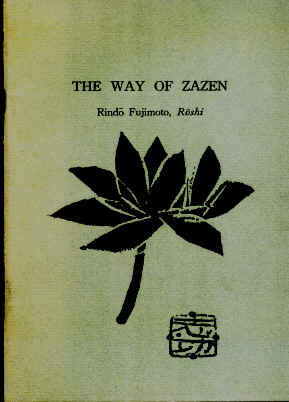 Rinzai Zen was the favored religion of the Samurai, for whom flexibility to act according to circumstances was more important than consistency of abstract principles; nevertheless, this did not involve the kind of freedom that many moderns have in mind. It is important for Western Buddhists to avoid self-righteous asceticism for its own sake as well as blind, unbending moralism; on the other hand, an equal hindrance to Buddhist practice is the temptation to justify the convenient and congenial as enlightened freedom. The writings of certain Buddhist monks, which are an expression of their samâdhi or satori, tend to convey an impression of a kind of cosmic paranoia. It should be remembered that the triumph described by the arhat (enlightened man) is control of his own mind and conquest of his ignorance by the Dharma (cosmic Truth) or his satori experience. The great freedom of the Buddhist mystic is not freedom to be boorish and immoral for his own convenience and comfort. Many descriptions of samâdhi and enlightenment are very misleading for beginners. In Japanese Zen today, there are three schools: Rinzai, Sôtô, and Obaku. Zen priests occasionally go for training to temples belonging to one of the other schools, and after their own realization, modify their teaching methods accordingly. The detailed differences between the schools are not important to the Westerner who wishes to practice meditation. It is best to begin by finding a good teacher when possible; when this is impossible, the written instructions of a master can be followed anywhere under almost any conditions. Rinzai kôan training requires at least occasional contact with a master. The kôan (a kind of existential question) and explanations of the same, from a number of quarters reliable and otherwise, have done a great deal to popularize Zen; they have also led to misconceptions. It cannot be too strongly emphasized that Buddhist zazen is not a technique to achieve something or get somewhere, to be followed like a recipe in a cookbook. It is also not a do-it-yourself psychotherapy, a tranquilizer, or a way to stimulate the "creative unconscious". Many benefits, physical and psychological, are not unjustly attributed to regular practice, but, if zazen is only a means to such ends, it is not Buddhist Zen and has many limitations. Sôtô zazen is a way of life in the same sense that some kinds of prayer are a way. Comparison of and attempts to evaluate different methods and teachers are of little value even to those with a certain amount of experience in meditation. A beginner should find a recognized teacher whom he can respect and who will accept him as a pupil; this teacher's method should be followed to the best of the pupil's ability. It is inevitable that in the beginning one will question the method more often than one questions oneself; however, shifting from one teacher or method to another, unless circumstances make this unavoidable, sometimes leads to disillusion and wasted energy. Zazen entered into as a kind of experiment is quite all right, but, until this attitude is transcended, Buddhist zazen is impossible. We have been asked by Christians and other non Buddhists if zazen meditation can be practiced by adherents of religions other than Buddhism. It is not necessary to be Buddhist to practice just quiet sitting which is not done in a Buddhist frame of mind. However, for those Christians who are accustomed to pray to a personal divinity, we must strongly caution them against mixing zazen and prayer. The two can be complementary, if the prayers involved are not for any personal benefits. However, during zazen all thought of an Absolute Other must be set aside. Some Westerners object to the ritual attending the zazen of Buddhist groups. Zazen may, of course, be practiced without ritual and without prayer; in other words, by only regular sitting. One's zazen experience, Buddhist or otherwise, eventually expresses itself in the individual's everyday life. Meditation for many is greatly aided by what one master calls "chanting samâdhi," particularly in the absence of a teacher's encouragement and correction. Chanting is a source of strength and it can also be a gentle reminder of the troublesome ego of the beginner who is likely to vacillate between protest and hopelessness. Intensive zazen, as a result of a natural kôan that has arisen in one's life - what is the reason for injustice or suffering, for example - may be the source of much mental and even physical discomfort. Prayer is helpful for some, but, for this, faith would seem to be necessary. Chanting a short sûtra (Buddhist scripture) or mantra (phrase), on the other hand, may be done with any degree of skepticism, perseverance being the only requirement. In many cultures where Buddhism has been introduced, the philosophical and ethical aspects have been the first to find favor, and these have been the concern of a well-educated minority. In Japan, this phase was followed by the elaborate ritual of the Heian period. The Buddha himself tried all these things before his enlightenment, and he did not sit in real meditation until all other possibilities had been exhausted. Kamakura Japan saw many changes, cultural and social, and with these changes came a distaste for the often mechanical and idolized ritual which had so inspired the aristocrats of earlier periods. Ascetic moralism had become an empty and self-righteous formalism, and men who wished a new and larger understanding of life were drawn to the simplicity and integrity of the way of the Chinese Chan masters. Once Japanese priests had known the Zen experience and Zen was firmly established, many of the elements of the older sects were reabsorbed, reaffirmed, and revitalized. In the lives of individuals who persevere in zazen, those things which are right and best for them will acquire new meaning; the unessential and trivial will drop by the wayside. With or without a teacher the process is always a very difficult one. It is natural for people to look for roots in tradition and convention; in skills; in family, professional, and communal relationships and functions. Zen realization does not negate these things, but they may be deeply questioned before and until their place in the cosmic scheme is realized. Love, self-sacrifice, and charity are natural expressions of Buddhist satori. Freed from egocentric and utopian ambitions, which often create as many problems as they solve, those expressions are of depth and a special kind of integrity. Zazen and everyday life become truly one only after real insight has been awakened and a new relationship is established with the "Ground of Being" and with all beings. In Japan there are three independent branches of Zen (Sôtô, Rinzai, and Obaku). All of these three are paths to the same goal and utilize the practice of zazen. Though the ultimate goal is the same for all Zen followers, means to that end differ somewhat. There are different practices in each sôdô;  however, I will describe those practices which I know from my own experience and which I use for my pupils. In spite of superficial disparities, I believe my experience contains no important or basic differences from the experience of others who practice zazen. Dôgen (Jôyô Daishi), the founder of the Sôtô school of Zen, did not wish to create a new sect of Buddhism; he had no interest in sectionalism or sectarianism, and he did not even like the term "Zen." In his youth he studied under various masters in his own country. However, dissatisfied with his understanding he finally sought a master in China, and under this teacher he experienced enlightenment. When he returned to his own country, he established a meditation center in the mountains, where he strictly disciplined his disciples in accordance with the spirit of Buddhism. I would just like to add that seen with the Zen "eye," the roots of the Sôtô way are the Buddhist spirit itself. Without the "Zen eye," I believe it is impossible to grasp the spirit of Buddhist doctrine. The appurtenances for Zen practice are as follows: first, a zafu,  a small round cushion, about one foot in diameter. Anyone who wishes to practice zazen should, if possible, have his own zafu. Secondly, it is a good idea for beginners to have a pencil and a small piece of paper beside them during zazen. This, however, is not necessary. We remember many important things while sitting, and it is a good idea to make notes of the problems or important questions which come up. Sometimes questions arise while we are reading or occupied in doing something and we resolve to think about them later. However, when later comes, we have forgotten the problems. During zazen many things come to mind and it is best to write them down immediately, in order to free the mind for zazen. When we sit, it is not always in a formal sôdô, and our arrangements must depend on the time and place. In this lecture I will take up both the form and content of sitting; these two should harmonize. Correct form (adjustment of body and breath) lead to the right state of mind. Ideally we should be able to sit at any time in any place. Sâkyamuni became enlightened through sitting practice; so we of the Zen school follow this way. In some other sects of Buddhism, doctrine or philosophy come before practice; in the Sôtô school, practice comes before theory. "Experiment"  is most important and it is necessary to follow the instructions of an experienced teacher. Next I will take up the proper position of the body. Sitting on your cushion, put the right leg on the left thigh and then put the left leg on the right thigh. This is called the lotus position. If it is not possible to sit in this way, the left leg may be put on top of the right thigh. This position is called the formal half-paryanka (Skt.). It is "formal" because reference to it is found in the "Fukanzazengi"  or "Instructions for Zazen" by Dôgen, the founder of the Japanese Sôtô school. I imagine that the reason for placing the left leg on top is because the left leg symbolizes quietness; the right leg symbolizes activity. It is also said that the left leg is a symbol of Fugen;  the right leg is a symbol of Monju. Therefore the left leg is traditionally placed on the top. Though the half-lotus position is acceptable, it is better to sit in the full lotus position (kekkafuza, Jap.) if it is possible for you. However, it is difficult and beginners in meditation quickly become very uncomfortable while sitting in this manner. In my temple, each individual sits in the way that is most comfortable for him. In other temples, one should ask permission if one wishes to sit in the half-lotus position, with the right leg on top. Next, it is important to balance the body properly. One should swing one's body first to the right and then to the left. This will loosen and relax the sitter. Swinging from one side to the other will make the sitting position stable. It is important that one's clothes be loose; they should not pull or bind anywhere (for example men's trousers). When we sit for a long time we get very stiff, especially during sesshin. Even those who are accustomed to zazen often experience this difficulty. People unaccustomed to sitting often get spells of feeling sick during a very long session. Therefore it is a good idea to massage the lower waist before and after zazen. I will now speak of the way to keep one's hands while sitting. The hand position (inzô)  is important; however, we should not concentrate on it and if the position changes while we are sitting, we should not allow this to absorb our attention. The correct position is as follows: rest the right hand, palm upward, against the abdomen just below the navel; and then put the left hand on the right hand in the same position. Put thumbs together for support. Correct breathing is important for zazen, for one must achieve harmony of mind and breath. Taiso Daishi believed that certain bad mental states were caused by lack of harmony between these two. Before zazen, a few very deep breaths help quiet the mind. Then after swinging one's body from side to side in order to achieve balance, one should again breathe deeply from the abdomen for a few minutes before returning to normal breathing. This normal breathing should be silent and not rough. It is important not to inhale too much air for a long period, as it is tiring. In the Rinzai school, strong pressure on the abdomen (while breathing) is perhaps overemphasized. It is not right to cling to the idea of breathing in a special way. A few deep breaths should establish the center of gravity in the lower part of the body. First, inhale slowly through the nose, using the air to expand the abdomen as far as possible; then exhale slowly (through the nose) till the abdomen has again contracted. It is necessary that the center of balance be in the abdomen. Chikara,  which means force or power in the abdomen, is essential in all traditional Japanese physical culture. I will now speak of the proper functioning of the mind during zazen. Beginners often ask me about their problems; however, it is very difficult for me to be of any help to them. Neither a short nor a complicated answer to peoples' questions is really helpful. It is all right to ask me questions, but it is not enough. One must experiment for oneself and then one will understand. After reading a book on the subject of swimming one must get in the water and find out about it first hand. A book cannot give one the experience. There are various ways of "quieting" the mind. The first way is "putting the mind In the left hand," which means projecting the mind into the inzô, or hand position. The inzô symbolizes the Buddha. When our mind is in the inzô, the body and breathing will be right. In Rinzai training, the kosoku kôan  is used to quiet (to clear) the mind. This is a good way to cultivate the Zen way of seeing; however, I think it is better to develop the Zen condition by shikantaza. This means devoting oneself solely to sitting; by quieting the mind and putting it in the left hand. The "Zen eye" finds its source in the Zen condition, and the Buddha's enlightenment is not the Zen eye, but the Zen condition. In Sôtô Zen we just sit; this is the most natural way. The main aim of zazen is to "let go of mind and body"; however, Buddhists sometimes pay too much attention to the mind and therefore they cannot get rid of it. The kosoku kôan may be useful; however, shikantaza is better because one has a tendency to cling to the kôan and to one's mind. Although we should "put the mind in the left hand," we must not pay attention to the mind. When we pay too much attention to the left hand, we are preventing satori. When we consciously put the mind in the hand, it is wrong. There are various kinds of good meditation. Satori is beyond all of these, and it is necessary to pass through the many regions of the mind before enlightenment. There are several stages of good meditation. These stages are only views on the way to the real satori experience. It is only possible to go through different kinds of meditation (states of mind) if one is faithful and keeps courage, and these states of mind are transcendable if we sit in right zazen. However they are not ideal states of mind, but states of mind on the way to enlightenment. Sometimes, they are wrongly understood as conditions of great satori, and one is apt to remain in them because they are happy conditions. However, a static enlightenment is an impurity. There is the Absolute Reality when we continue on, abandoning all. Mahâyâna Buddhists stress the spiritual world; on the other hand, some people do not recognize a spiritual world. In our Sôtô school, some monks claim that we need not discipline ourselves with zazen; they think we need only believe in our original Buddha nature and realize that we are full of defilements (Skt. klesa). From the point of view of faith we all have the Buddha nature or honshô  (original enlightenment); indeed, we are all complete Buddhas. And honshô myôshû  means that original enlightenment itself is myôshû or real practice. Both original enlightenment and practice are different names for the same thing, and so belief in original enlightenment is realized in the form of zazen practice and discipline. Awakening without practice or discipline does not exist. Dôgen's way is continued practice, which is an expression of original enlightenment and not just a means to an end. The only real practice is forgetting enlightenment; this is the real honshô myôshû. Therefore, he who disregards practice should not be called a Buddhist. There are many sects of Buddhism and they are divided by different ways of discipline. In the Sôtô school we call the apogee of Buddhist doctrine honshô myôshû. In this belief we practice from the beginning. Therefore, we do not set any special stages to enlightenment and we do not emphasize doctrine. When we speak of putting the mind in the left hand, we speak in the spirit of honshô myôshû. If one puts his mind in the left hand with conscious attention on the mind or on the left hand, relativity results. We should sit in zazen forgetting the mind and the left hand. In shikantaza one has a tendency to fall into a negative zazen which results in apathy and sleepiness. In order to avoid this we use a kôan called genjô (lit. meaning: accomplished in the present) which means that the present, just as it is, is the reality of our ideal world. The man who clings to life suffers in this phenomenal world since he cannot see beyond phenomena. However, the enlightened ones see through the relative world with all its limitations to the absolute and infinite reality, and therefore are able to reside in this phenomenal world as a spiritual realm. The enlightened one and the sufferer who clings to transient phenomena see the same world in a different way. This is a wonderful question and therefore it is called a kôan. Beginners in zazen usually find their minds confused and disturbed. This is natural. There are two great obstacles to zazen. The first is konjin,  which means depression or a kind of melancholy. When a beginner experiences konjin, it is usually in the form of sleepiness. Experienced sitters who have calmed and quieted their minds sometimes feel faint. And if the zazen condition deepens more, the sitter may fall into musôjô,  or "no consciousness." Some people believe that the zazen mind is simply loss of consciousness; however, this is wrong. In the right zazen mind, all aspects of consciousness do not function, but this does not mean unconsciousness as in sleep. The mind condition in zazen is called "shônen sôzoku,"  or the "succession of right-mindedness." This is different from the "no-mindedness" which implies no consciousness. It is a good thing to calm the waves of the mind; however, a sleepy or dead condition, is a kind of konjin. Some people feel they are in a deep fog or melancholy. One must rid one's self of such mental conditions. The second obstacle to zazen is called jôko. For beginners this means to be in a fidget with many thoughts or ideas running through the mind. There are two types of mind waves: the first, ideas created by oneself from inside; the second, those which come from outside through the senses. Those who have experience in zazen may feel great elation; they may jump up from their cushions believing they have attained enlightenment. This can result from sitting intently in the wrong way. Or, they may see the great light of the Buddha  and feel grateful and ecstatic. Such experiences are serious obstacles; they must be overcome as quickly as possible. These conditions are sometimes thought to be enlightenment; however, they are the result of bodily or mental fatigue or of a misunderstanding of the meaning of zazen. When zazen has deepened, one may feel bursts of great joy. The real satori is called "the mind of great joy." This joy, however, emanates from the mind which has transcended all relative joys as well as sorrows. Therefore we must not try to grasp these small joys; we must go beyond them, no matter how difficult and undesirable this may seem. One way of avoiding jôko while sitting is to look at the edge of the nose and lower the feeling to the abdomen. However, we must not make a conscious effort to look at our noses. To avoid konjin we may concentrate on the point between the eyebrows until the point rises and raise the feeling to the forehead, change the focus of our eyes or breathe deeply and silently. The best remedies for jôko or konjin must come from our own experience. The kyôsaku,  or long flat stick carried by the monk who presides over meditation in Japanese sôdôs, is also a remedy for konjin and jôko. When we feel sleepy or are in a bad frame of mind, we should ask for the kyôsaku. The sound of the kyôsaku will awaken our neighbors too. The kyôsaku is better than any kind of advice; though it may disturb some people, this is not a bad thing. Those who have never practiced zazen sometimes think that the kyôsaku is a dreadful object. Actually we appreciate it when we are sitting. If we wish to receive the kyôsaku, we must make gasshô  when the monk in charge is directly behind us and move the head to one side. The monk in charge of the meditation is authorized to whack sitters when he thinks it is necessary. Especially during sesshin, even those with long zazen experience appreciate the kyôsaku. Receiving whacks from this stick is an opportunity; the stick is the sword of Monju, which cuts through illusions. Finally, I wish to discuss the content of mind adjustment. First, however, I will explain the meaning of daienkyôchi,  or great mirror mind. Although this term is used descriptively in the Vijñânavâda school, [25a] I wish to utilize it to try to explain the state of the zazen mind. Those who are not enlightened have ego-centered minds which are the result of illusion. Their attitudes and behavior are egocentric. However, a Buddha has no such egocentricity. Therefore, the difference between the unawakened and the Buddha depends on the degree of their self-centeredness. Adherence to self is called gashû;  the cause of gashû is called hosshû,  which is a kind of illusion created by a misunderstanding of phenomena, not conceived as interrelated and interdependent parts of the same reality. Therefore, when we free ourselves from ego-centeredness, our mind is the mind of Buddha and illusory knowledge is transformed into the four wisdoms of Buddha. Of the four wisdoms, [25b] the daienkyôchi is the basis for the other three. When we are not stabilized in daienkyôchi, we are isolated from others and this isolation stimulates self clinging. The secular mind reflects all phenomena. It belongs neither to the illusional nor to the enlightened world and it is the fundamental state of mind which can create either the former or the latter. Zazen, as a practice, transcends the sixth and seventh mind categories [25c] and can change arayashiki, the eighth state of mind, into an enlightened mind and the state of daienkyôchi. I like to use daienkyôchi to describe the zazen mind in order to avoid two common misunderstandings. The first is that one should have a completely empty mind or should lose consciousness while sitting. Perhaps this misunderstanding arose because Hakuin Zenji in his "Song of Meditation" said that we should have a mind of no-mind during zazen. However, this means that the mind remains, even though we give up discriminating. If "no mindedness" is interpreted literally, the resulting condition is the death of the spirit. There seems to have been such a meditation in India before Buddhism. An empty negative mind in sitting is not a Buddhist form of zazen. Mahâyâna Buddhism teaches that we find the present world sordid because our minds are clouded; however, when the kokoro  (mind and heart) are clear, the present world is the spiritual world. The Mahâyâna teaching shows us a way to dispel illusion. In order to do these things, sitting is better than sleeping. Sôtô zazen superficially resembles what is usually thought of as contemplation. However, if one contemplates (while sitting) a Creator God or "the fundamental principle" or if one makes any concept or symbol a subject of the mind, this can only lead to mental illness. There can be no complete enlightenment as long as there is any concept or image. All concepts and images are relative and phenomenal. We should not try to retain anything at all in our minds, for this would be like trying to hold a full cup of water and to watch the water in order to keep it from spilling. A static condition is not the right zazen. Real zazen is "letting go of the mind and body" (shinjln datsuraku). This means there is no object and no objective of zazen. Though we must do our best to find the Cosmic Nature in the heart of infinity, this should not be understood as either u  (being) or mu  (non-being). When I say that one should stop all discriminating activity, cerebral people will feel uneasy. However, this uneasy feeling is a kind of egotism. I would like to add, that to try consciously to remove one's self from one's ordinary situation is very bad. While sitting we must exclude every kind of prejudice and we should eliminate purposive mental activity. This means that daienkyôchi is the state of Buddha, Infinity or the Absolute, in which there is no egotism. The Buddha mind is a large round mirror which reflects and shines on everything. Those who cling to the relative or phenomenal cannot know this state of mind. On the other hand, an enlightened one does not feel himself to be different from other people. How may we achieve daienkyôchi? For this we must not cling to our egos. The function of the mirror is to reflect what is before it; however, the mirror remains quiet in spite of the activity of the reflections. The mirror does not color its reflections. We must try to keep a mirror mind even though in actuality we have a strong self-will which is responsible for our quarrels and other such behavior. The ego can be compared to dark glasses; through these glasses everything looks dark. We should stop clinging to our egos and prejudices. The mirror has no color and reflects everything clearly; moreover, it misses nothing and embraces everything. A mirror state of mind is difficult to attain, so as we proceed, we must remain aware of our limitations. Even the enlightened must do this. We should not forget that we cannot change ourselves or our minds quickly and easily, and we must know clearly where our inadequacies lie. When we speak of personality in its usual meaning, we are alluding to that which rests on the foundation of the personality, in the Buddhist sense. We should be able to see the latter through the former. And we should remember that as long as there is no real universality there will be much evil in the world. Since the main aim of zazen is to rid one of blind egotism, Buddhists sometimes criticize and condemn ordinary common sense, which they confuse with ego-centeredness. Even enlightened ones use and develop their intellects; to kill the intellect is to kill humanity. When we sit, we should not think about getting anywhere or about enlightenment. We should not think about entering enlightenment physically or mentally. We should not consciously try to create it. Furthermore, if we rely on "the power of Another" (tariki),  we cannot become enlightened. After experience in zazen, all our other activities should become zazen; meditation practice is not only sitting, but our whole lives. The most important thing for beginners is quiet sitting. In Buddhism since ancient times, zazen has been divided into two aspects, shi,  or stopping, and kan,  or a view. At first, by sitting, our moving or wavering minds of daily life are quieted and a calm and pure mind, able to see the reality of things, appears. This is shi. And by this shi, daienkyôchi, which is the true character of our minds arises, and we are able to have a truly objective view of the world as in a mirror, which reflects everything as it is. This is called kan. The ideal quiet of zazen transcends relative moving and quiet, as the quiet of a mirror is that of quiet beneath all motion. Therefore in Sôtô zazen we do not divide shi and kan, we prefer to say, shi is kan and kan is shi. Moving and quieting are not two and zazen involves transcending both of these. Daienkyôchi is the great problem for our disciplinants. Our kôan of shikantaza is the genjô kôan. From the standpoint of honshô or original enlightenment, everything reflected in the mirror of our minds is a sight of the accomplished Buddha's Pure Land, and we call it genjô or the accomplishment-in-present, but actually it is a great unknown problem for us, and so it is in practice a kôan. For the followers of Sôtô Zen, the original kôan is the genjô kôan, and we believe that even the people disciplined by kosoku kôan experience great satori by the genjô kôan. In other words, all their direct chances to daigo , or the great satori, have been through the genjô. During our zazen, we should not be disturbed by objects of which our senses make us aware. We cannot refuse to permit sensations to enter our minds; however, we should not cling to the sensations. If one worries about noise or talking while sitting, one is very far from the satori experience. One should not be worried about anything. Sensations themselves are not mâyâ (illusion) or bad for discipline, but one should not cling to them. When our minds are pure (clear), our senses are good things for us. In the sphere of mâyâ, our minds settle somewhere and become attached to a small relative world. Modern men do not like to allow themselves to stop discriminating long enough to enlarge their world and this is not a healthy mental attitude. When our minds become empty in the true sense, when we forget our mind's existence, then we find ourselves in the Buddha's joyous meditation. It is very important to strive towards the right zazen mind in our daily lives and for all our lives to become zazen. 僧堂 sôdô : A temple which has a meditation hall; a meditation hall. In the Rinzai school it is called 禪堂 zendô. [Return]. This is not permitted in other sôdôs. [Return]. 普賢 Fugen : Samantabhadra-Bodhisattva (Skt. ), symbol of the Buddha's compassion. [Return]. 文殊 Monju : Mañjusri-Bodhisattva (Skt. ), the symbol of the Buddha's wisdom. [Return]. According to the 健康普説 Kenkô-Fusetsu by 面山禪師 Menzan Zenji, either the right or left foot may be placed on top. 法燈国師 Hôtô kokushi wrote (in the 坐禪儀 Zazengi) that it is permissible to have the right leg on top. [Return]. 接心 sesshin : A week-long period of zazen. [Return]. 煩悩即菩提 bonnô soku bodai : The temporal and spiritual worlds are one. [Return]. 古則公安 kosoku-kôan is a "case" history from antiquity, of the enlightenment experience of a Chinese or Japanese Zen master. These kosoku are used as subjects of meditation in Rinzai Zen. From the Sôtô point of view, all kosoku are expressions of the 現成公安 genjô-kôan which they consider to be the original and formless kôan. For the Rôshi's explanation of the genjô-kôan see p. 10. [Return]. 只管打坐 shikantaza : To concentrate completely on sitting (zazen). [Return]. Those from a non-Buddhist background may see flashing lights which may be associated with understanding. Christians may see light in conjunction with some Christian symbol. [Return]. 警策 kyôsaku : In the Rinzai sect, this is pronounced keisaku. [Return]. 合掌 gasshô : Palms joined in the attitude of prayer, the left hand symbolizes the phenomenal world and the right hand the spiritual world. [Return]. 8) 阿頼耶識 araya-shiki (âlaya-vijñâna = store-house from which come all "seeds" of consciousness) [Return]. In this context, egocentricity should not be understood as only selfishness in the ordinary sense, but rather as an inability to apprehend the true nature of the self and its relationship to the cosmos and to other forms of life. This apprehension is not a philosophic abstraction involving only a unity of particulars in which all diversity and conflicts dissolve. It is total awareness of the Genjôkôan. [Return]. Some Zen and Taoist monks are supposed to have expressed their satori experience by a great burst of laughter. [Return]. Reproduction interdite. Lire la version française, La Voie de zazen. Lire la version italienne, La via dello zazen.